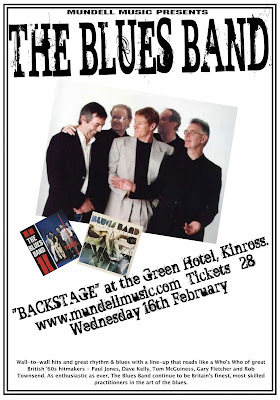 The Blues Band play "BACKSTAGE" at the Green Hotel, Kinross on Wednesday 16th Feb 2011. 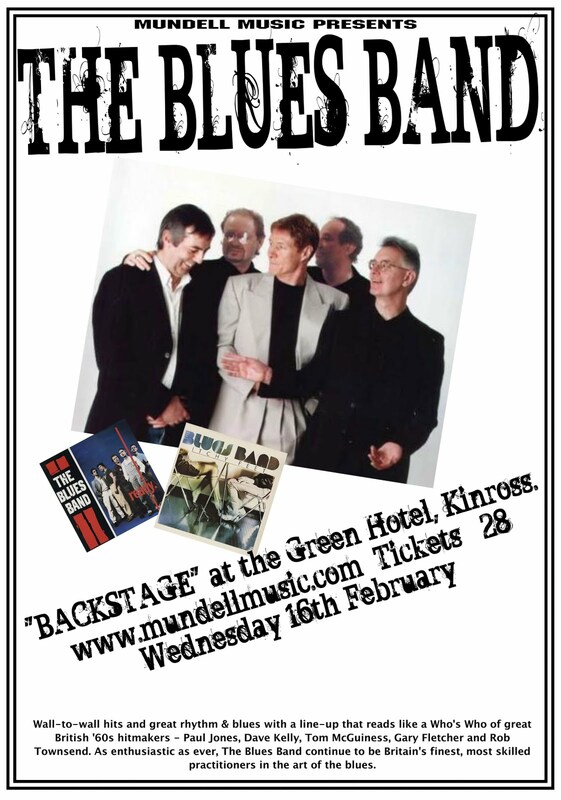 The individual members of The Blues Band were already held in admiration by generations of rhythm & blues fans when they formed back in 1979. Almost two and a half decades and over 16 albums later they continue to add to their growing army of followers, and it’s not unheard of to find three generations from the same family at a gig. The band are today acknowledged throughout Europe and beyond as being amongst the very finest purveyors of rhythm & blues. They have inspired numerous other blues bands, many of which have come and gone …The Blues Band have remained a constant, increasingly popular fixture, however, and all with only a modicum of help from the record business – as Gary’s oft quoted comment states "the music industry doesn’t bother us and we don’t bother them." This independent streak goes right back to their early days when in an unusual move the band "bootlegged" their own first album – certain copies of which are now collector’s items. The ‘bootlegging’ came about because, having recorded their first album, the so called ‘major label’ which was to release it changed their minds and the band didn’t have the cash to pay the studio bill. So they got 1000 copies pressed up, mastered from a copy tape that they had, signed the plain white numbered sleeves and sold them at gigs & via mail order etc. Only then did another ‘major label’ pick up the album and release it widely. It’s a credit to both the band’s talent and to their many thousands of fans’ loyalty and support that they have since sustained such a long career, and brings into question the oft-spoken phrase by parents despairing of their aspiring musical offspring, "When are you going to get yourself a proper job?"